The Potawatomi Tribal Land Office (Land Office) is responsible for coordinating the Nation’s land acquisitions, coordinating the Nation’s purchase of undivided interests in trust lands, executing the Nation’s fee-to-trust applications, maintaining the records of the Nation’s land holdings including purchase documents, appraisals, reports, maps, etc., and acts as a liaison between the Nation and the BIA, as well as other necessary agencies, in regards to the Nation’s land business. All tasks are conducted with guidance from Tribal Council through the General Manager’s Office. Tribal Land Holdings – The Nation’s land mass consists of 673 tracts (33,720 acres) through tribal allotment and owned individually by the Nation. The following table illustrates the ownership of the Nation’s land mass. Data is current as of 12/31/2015. Based upon a Reservation size of 77,440 acres, the Nation’s on-Reservation holdings and tribal allotments account for 41.4 % of the Reservation’s land mass. Land Acquisitions – In 1998, the Nation established a land acquisition program with the purpose of re-purchasing Reservation land, previously sold by the Nation or its members. 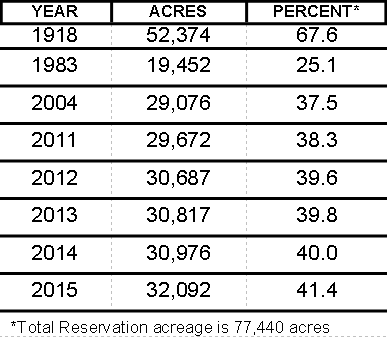 The following table illustrates the reversal in declining tribal on-Reservation land ownership from 1918 thru 2015. Undivided Interests – In 2014, the Nation re-implemented the program for the purchase of undivided interests in US Trust land. The purchase of undivided interests generally follows a six-step procedure, managed by the BIA Horton Agency. The BIA completes the transaction and files the deed. Since the policy was re-established, the Nation has increased its holdings by 3,582 acre-equivalents. Completion of the transfer into trust. The following table illustrates tracts that are currently in the process. Records Management – The Land Office maintains purchase documents, appraisals, reports, maps, etc. for all of the Nation’s land purchases. Currently, staff are scanning these documents to create a digital records database, the Potawatomi Tribal Land Information System (PTLIS), and also working on developing an on-line mapping app to illustrate the Nation’s property ownership. Do you want to try out the Nation’s new mobile mapping app on your smart phone? It’s free! Just go to the app store and download ArcGIS by ESRI. Once installed, open the app and search for the “Potawatomi Lands” map. Realty Liaison – The Land Office has a working relationship with several local, state and federal agencies.